Oak Hammock Marsh Interpretive Centre unveils a neotropical migratory bird exhibit. Oak Hammock Marsh, Manitoba – Oak Hammock Marsh Interpretive Centre (OHMIC) will unveil its new Neotropical Migratory Bird exhibit on Sunday, March 25, 2012 at 1:30 p.m. The exhibit re-creates the sights and sounds of a tropical mangrove wetland. It features a rare collection of 22 life-size bird carvings by the Skeete family of carvers that was donated by the Graeme Hall Nature Sanctuary in Barbados. 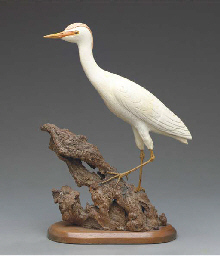 This unique collection, the largest know group of its kind in the world, is ideally-suited to the new exhibit that shows familiar migratory birds from Canada sharing an exotic mangrove wetland with resident Caribbean birds. Visitors will be invited to follow Wally, the Yellow Warbler, on his annual migration from Oak Hammock Marsh to the south. Arriving at Wally’s destination, visitors will use a viewing blind, binoculars, and interpretive signs to search for Wally among the mangroves that he shares with a variety of herons, egrets, and other resident Caribbean birds. “The Interpretive Centre was thrilled to receive the generous donation of these exquisite and unique carvings” said Michele Kading – the Head of Interpretation at OHMIC. The new exhibit will help visitors to Oak Hammock Marsh realize the critical importance of Caribbean wetlands in the conservation of Neotropical birds.